Continuous Positive Airway Pressure (CPAP) machines are used as treatment for the serious condition, sleep apnea. If you have this condition, then you probably know that it not only inhibits sleep and causes fatigue, but it can contribute to a variety of other health conditions as well. Heart disease, stroke, heart failure, and even a shortened life span can all be linked as complications for people with sleep apnea. CPAP machines work well as a treatment for sleep apnea and people often find their lives restored back to normal health. The difficult problem comes with the fact that, for some people, CPAP machines may be uncomfortable when they are hooked up to the face. This can cause people to lose sleep for a different reason that the blockage of airways. The good news is that CPAP pillows have been designed to work specifically with CPAP machines, adjusting for comfortable sleeping positions while keeping the breathing mask in place. Most CPAP pillow are made from memory foam, offering different features that are useful depending on the specific needs of the individual. Taking a look at the top CPAP pillows today can help you to make a good choice of which might be best for you. Affordably priced under $40, this CPAP pillow comes highly recommended and offers safe, effective sleeping options for people who have sleep apnea. Comfortable softness while promoting support for neck and spine alignment. Contour Design. Sleep comfortably in any position: back, side, or stomach. Fits standard pillow case or use custom cover. Fewer air or pressure leaks. Reduces facial pressure, bruising, and discomfort. Works with CPAP, Bi-PAP, or APAP machines. Works with full face or nasal design masks. Fall asleep faster, stay asleep longer. Also useful for post-surgery related to thoracic, plastic, or orthodontics. Customers who have reviewed the EnduriMed CPAP Comfort Pillow on Amazon give it over 4.0 stars, with more than 180 reviews. One customer ranks it with 5 stars and notes that she has been sleeping with a CPAP machine for years, but is so much more comfortable now when using the CPAP Comfort Pillow. 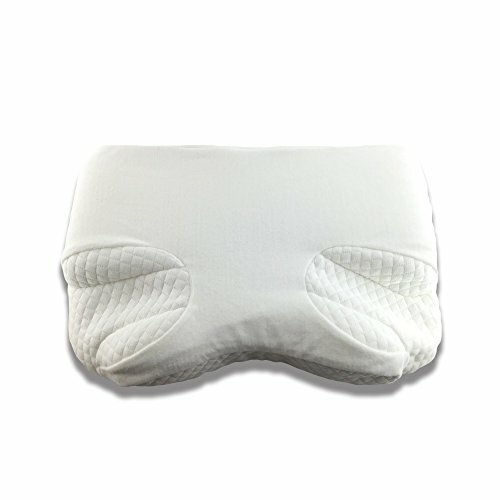 Another verified purchaser notes that this pillow is highly recommended–perfect for use with a CPAP mask. One other five-star reviewer mentions that he did not especially like the pillow the first night that he slept on it, but after a few nights, he grew accustomed to it and found it to be comfortable and just the right amount of firmness. In a slightly higher price range at under $60, this second generation comfort pillow from EnduriMed offers extra neck support in the design, accommodating people who are smaller or larger in size. New Design with two thickness levels. Two head and neck rests to provide maximum comfort for large and small people. 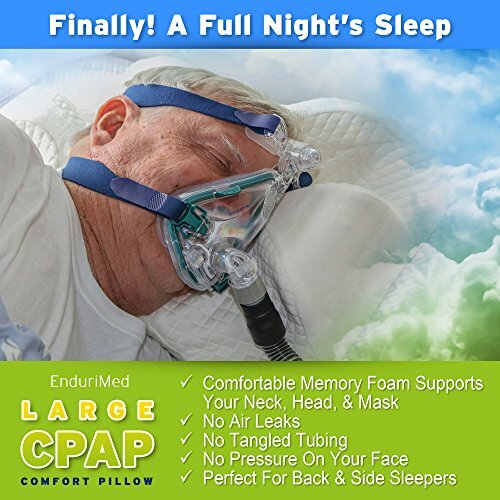 Use with CPAP, Bi-PAP, and APAP machines. Useful for people who sleep on the back, side, or stomach. Reduces pressure on the face. Additional cases available for separate purchase. 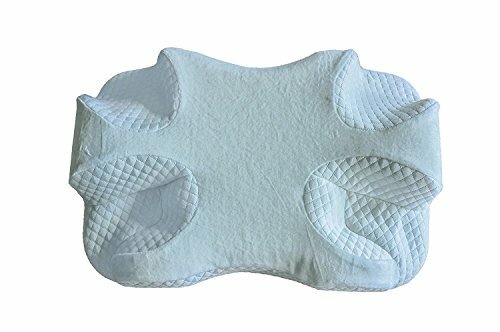 Based on reviews from Amazon this pillow has gained an average of more than 4.0 stars with more than 200 customer reviews. One reviewer mentions that she wishes she had known about these pillows sooner as her husband moves around at night putting the seal on his CPAP machine at risk. But with this pillow, everything works as it should and the mask stays in place. One verified purchaser notes that she had been struggling for more than a year to find a pillow that would work with her CPAP machine. Finally, she found this one and is sleeping very comfortably. Another customer mentions that this pillow works okay, but he does say that it is not as soft as he would like it to be. For people who like a firmer pillow, it would be useful. These three CPAP pillows are some of the best CPAP pillows with various options for prices, comfort, and different preferences. Using a specialized pillow with a CPAP machine helps to keep the mask and tubing in place, reducing leaks and making sleeping more comfortable for the user. If you’ve been diagnosed with sleep apnea and use a CPAP machine but have been having a hard time getting a good night’s sleep, consider a buckwheat filled or memory foam pillow designed especially with you in mind.